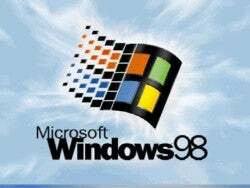 Not huge news, but if you're anything like me, you're probably still triple-booting Windows 98, 98 SE, and ME just for the old-timey masochistic thrill of it all. Well, it appears that Microsoft will officially stop supporting these operating systems on July 11 and they all contain a security hole so big that it will make pr0n spyware problems seems as innocuous as an errant system clock. These OSes are extremely vulnerable through TCP port 139, so you should button things up tight and wear a conundrum when using 98 machines.